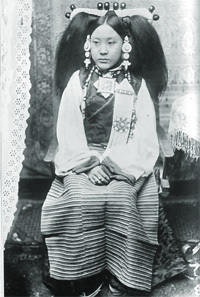 Portrait of an aristocratic woman of Lhasa wearing typical Central Tibetan coral and pearl headdress, turquoise ear-rings, a “gau” (amulet box) at her neck, and the married woman’s striped apron. The pose and setting, with the European furniture and textiles of a wealthy Lhasa family, is carefully arranged in the style of Indian studio photography. Oddly, even though Tibet as a distinct political entity in its own right has disappeared, its relevance and recognition as a land with a unique culture of its own has never been greater. This volume is a compendium of contributions by leading historians on the interplay of relationships between the land of the Lamas and the world outside. Spanning the entire gamut of its long and tumultuous history down to the present, it offers a by no means ill-deserved tribute to the country and its people. Its range is wide and the texture rich. Subjects as diverse and intriguing as Tibetan expansion from 7th to 8th century; military administration and military duties in Tibetan-ruled Central Asia; historical and religious relations between southern Tibet and Bhutan; a critical assessment of the Nepal-Tibet Treaty of 1856; political, economic and religious relations between Mongolia and Tibet; and all that the Tsar’s generals were planning to do in Tibet in the opening years of the 20th century, find a mention. This is not to unsay that more recent events have been ignored. Rather, Tibet’s relations with the US, the "transformation" of its national identity and the interplay of conflict as well as conciliation between its two supreme incarnate Lamas, the Dalai Lama and the Panchen Lama, in recent decades find a deep resonance in these pages. The volume, beautifully printed and lavishly illustrated (from the Charles Bell Collection), grew out of week-long deliberations at St Andrews in September 2001 which this reviewer had the privilege to attend. Here a galaxy of scholars from lands as far apart as the US and Russia, Japan, India, Nepal, Mongolia and nearer home the EU countries (Belgium, Germany, France) made their presentations. It would be invidious to pitchfork any one or two contributions for special mention, but depending upon the reader’s interest and inclination, it is amazingly rich and varied fare, embracing political, social, economic and cultural facets of a remarkable civilization. Alan McKay, author of Tibet and the British Raj (1997), has woven the different strands of the conference deliberations into a rich tapestry, explaining inter alia that the choice of St Andrews as the venue was to honour Hugh Richardson. An old member of the lCS, Richardson was to spend almost 15 years (1935-50) in Lhasa, leaving there on the very eve of the Chinese "liberation" of Tibet. Apart from serving the Raj, he did a brief stint in independent India, too. In the decades that followed, he retired to SA where his depth of knowledge and understanding, and an impressive corpus of writings gave Richardson an exalted position as a leading authority on Tibet in the English-speaking world. His death in December 2000 deprived the conference of an opportunity to use his talent. It became, to everyone’s regret, one of "in memoriam" rather than "in celebration".